I grilled four New York Strip steaks over direct high heat and made a little video of the whole cook. I love this video; it is pure grilling and nothing else. I have watched this a couple times and it just makes me happy. At this point I feel like I have enough experience under my belt to talk write a meaningful Weber Jumbo Joe review. The size is perfect for this class of grill. I have had a great time playing with my Jumbo Joe. The Jumbo will absolutely displace my Smokey Joe Gold and 18 inch One Touch Silver. 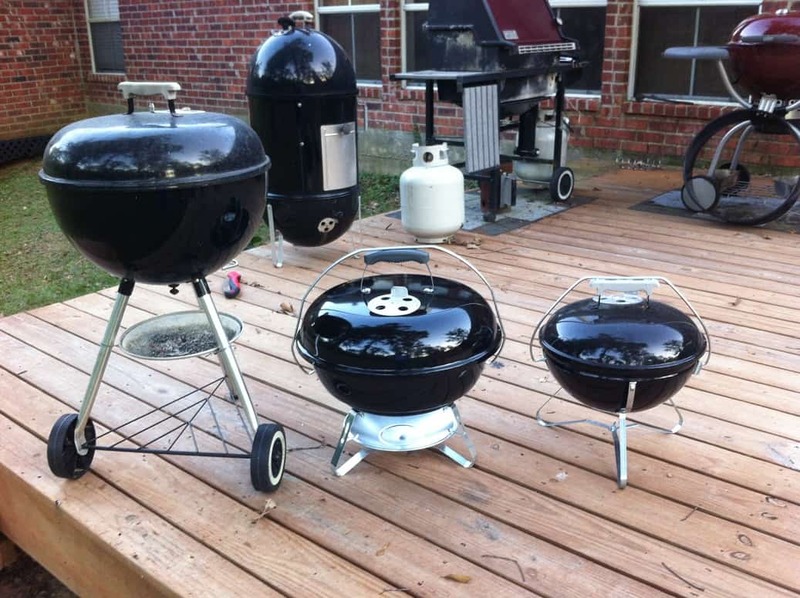 Here is a picture of the three grills side by side that really brings things together for me. 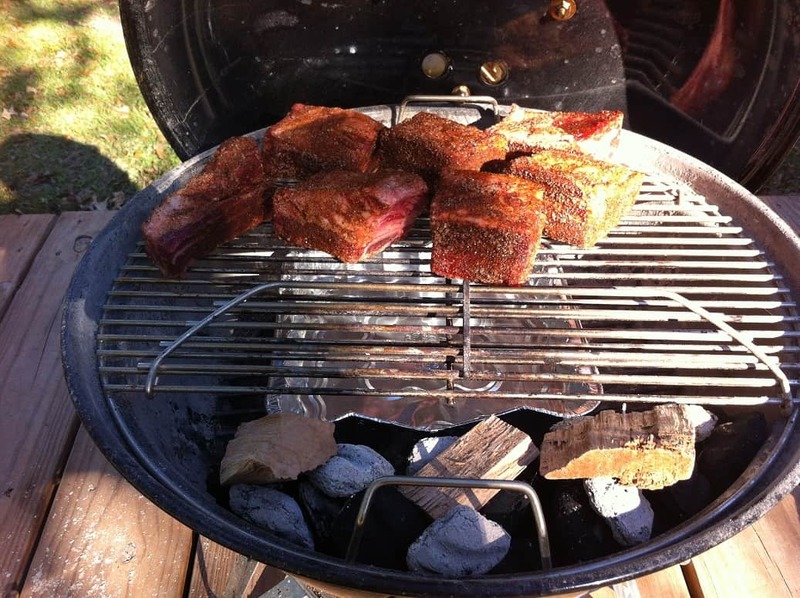 The Jumbo Joe, in the middle, has the portability of the Smokey Joe Gold but has a much larger cooking area. I really can’t imagine why anyone would buy a Smokey Joe Gold now that the Jumbo is available. I also like the Jumbo much better than the One Touch Silver. Not only can you take the Jumbo with you but its shorter height actually makes it easier to set up a rotisserie. Again, not sure why anyone would buy the 18 inch One Touch Silver. The Jumbo is easy to control. There really wasn’t a learning curve for this grill. The location of the air vents lets the Jumbo cook just like every other Weber kettle. 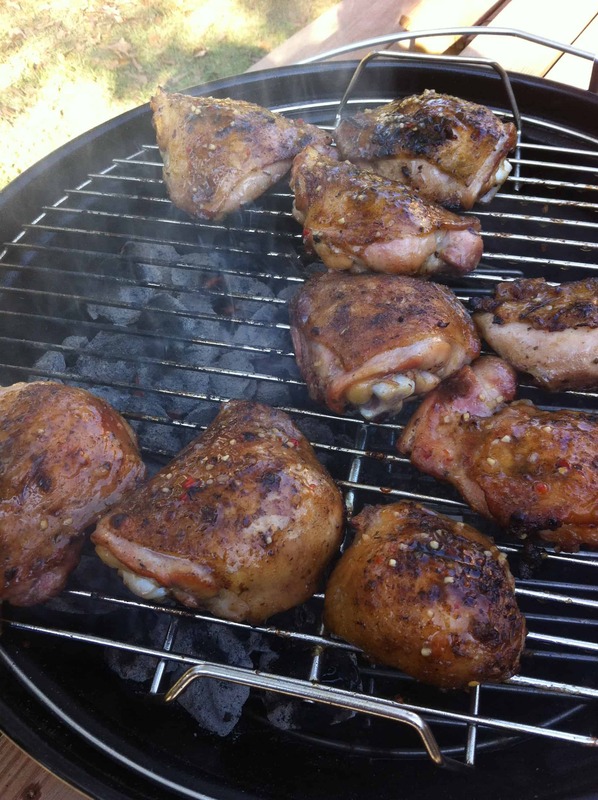 You can let the grill run wide open and do some great grilling or choke the dampers down and take things a little slower. The Jumbo travels well. I loaded the grill in the back of my SUV and drove it around town and back and forth to work for a week. After about two hundred miles of stop and go Baton Rouge traffic I can report that it does not make a constant irritating metal on metal squeak. It is also pretty stable. The Jumbo was completely unrestrained in the back of the SUV and only tipped three times. On two occasions I had to slam my brakes and I flipped the Jumbo both times. I also managed to flip the grill when I had to cut a very sharp turn. No damage was sustained and the ash catcher stayed in place. 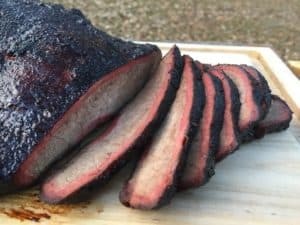 The only negative in the Weber Jumbo Joe review is that it simply is not large enough to use for low and slow cooks on larger cuts like packer briskets and whole slabs of baby back ribs. The second drawback is that you will end up buying a separate hinged grate to make low and slow cooks with smaller cuts an easier job. It would be nice of the hinged grate was standard issue for this grill. If you are looking to get into the Weber line and are hesitant to shell out hundreds on a larger kettle then for $60 go ahead and try the Jumbo. Although I really love the Jumbo it is NOT a standalone grilling solution. At some point you will want to buy a 22 inch kettle so you can cook some serious ribs. If you know any Weber fans let me also suggest that the Jumbo would make a great gift. I can’t imagine anyone who loves Weber grills that wouldn’t enjoy owning a Jumbo Joe. Judging from the 104 five star reviews this guy has gotten on Amazon I am not the only person that thinks this is a great grill! Click Here to Buy the Weber Jumbo Joe! Be sure to check out the other cool Accessories for the Jumbo! Jack, Thanks for the kind words and checking out the site! I am using the rotisserie and support ring that is sold by Weber. It is designed to fit onto a 22 inch kettle which is why I had to use some bricks to support it in place. You can buy this from Weber or from Amazon (there is a link to the product on Amazon at the bottom of the Review post). Cajun Bandit also sells a 22 inch rotisserie assembly. I don’t have any experience with their product but have heard good things. Can i use some of your pictures for my website? Sure, just make sure to include a link back to this site.